Don't Be Koi. There's Something Fishy About That Trump-Abe Photo : The Two-Way At a ceremony at Tokyo's Akasaka palace, the president appears to grow weary of a traditional koi feeding — so he simply dumps the contents of his box of fish food. But video tells the whole tale. President Donald Trump and Japanese Prime Minister Shinzo Abe feed koi fish during a welcoming ceremony in Tokyo on Monday. Perhaps a metaphor for East meets West? The patient, tradition-bound Japanese prime minister contrasted with the brash, abrupt American president. 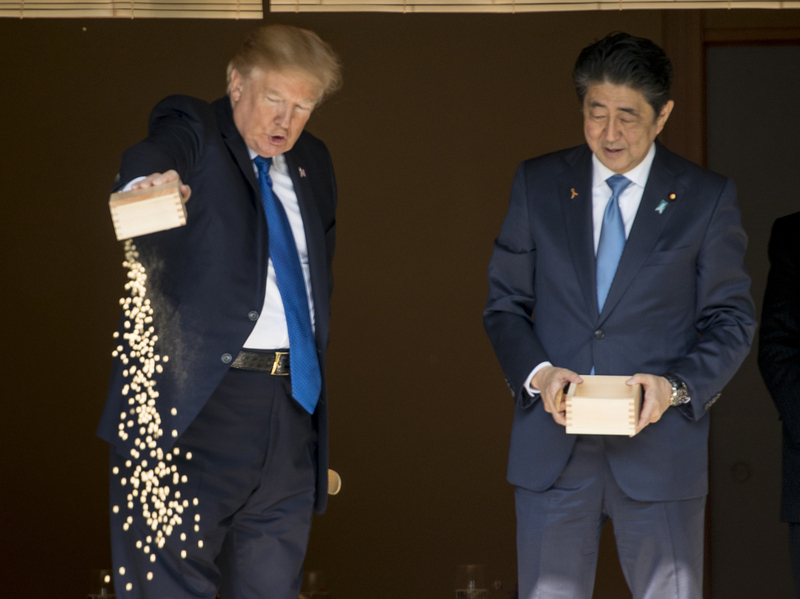 As part of a welcoming ceremony, President Trump stopped with Japanese Prime Minister Shinzo Abe to feed the koi fish at a pond on the grounds of the Akasaka Palace in Tokyo. It's a tradition with foreign dignitaries. 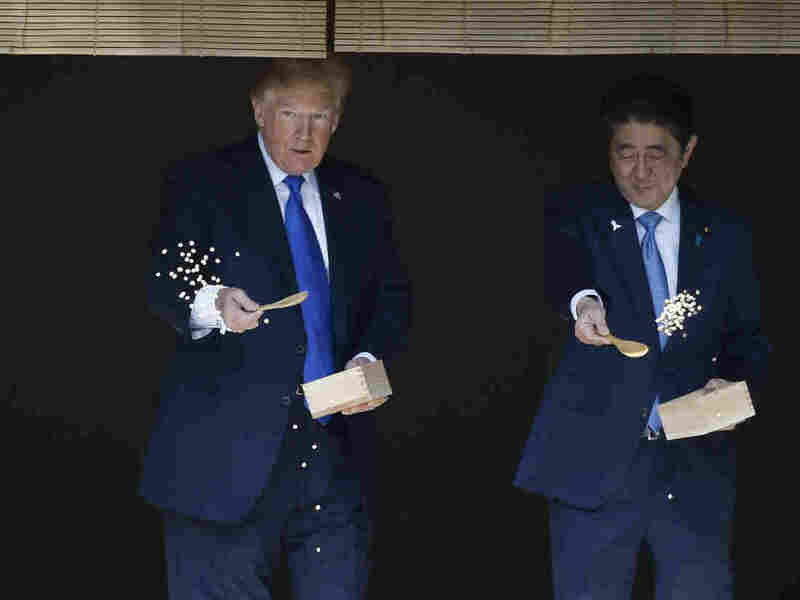 Trump pours the remainder of his fish food out as he and Abe feed fish in a koi pond at the Akasaka Palace, on Monday. "The incident triggered censure on Twitter, with many pointing out that fish cannot consume such a large amount of food at one time. "U.S. Secretary of State Rex Tillerson, standing just behind Trump, appeared to break out in laughter at his boss's no-nonsense approach to koi feeding. "But some uncharitable Twitter users were less forgiving, with several writing: 'Trump can't even feed fish right.' "
Koi don't have very good impulse control in that regard, and will probably overfeed and become ill as a consequence if no one cleans that up. Either way, as cultural faux pas by visiting U.S. presidents go, it would be difficult to compete with President George H.W. Bush's "vomit incident" at a state dinner with then Japanese Prime Minister Kiichi Miyazawa in 1992 or President Barack Obama bowing to Japanese Emperor Akihito during a 2009 visit to Japan, which sparked controversy among conservative critics in the U.S. Upon meeting Akihito, Trump opted for a handshake.